A decision on whether to continue free late afternoon parking in two Elgin multi-storey car parks has been deferred. The initiative – which ran for seven months on a trial basis – will now form part of a much wider review of parking in the town. The review was approved by councillors in December as part of plans to develop a parking strategy for Elgin. The Free After 3 trial ran from June until January this year at the St Giles and Batchen Lane multi-storeys and followed a request from the Elgin Business Improvement District (BID) which believed it would help stimulate retail activity in the town centre. The council’s economic development and infrastructure services committee was told today that both car parks had been significantly busier during the trial period and that the scheme had been well received by town centre shops and businesses. However, the trial had cost the council nearly £17,000 in lost revenue over the seven months, equivalent to £30,000 in a full year. And although feedback from the Elgin BID had shown popular support for the scheme, it was not possible to calculate its true value in terms of economic impact. Councillor Fiona Murdoch, seconded by Councillor Allan Wright, moved that the Free After 3 scheme should not be reintroduced. However, the motion was defeated seven votes to six by an amendment from Councillor Pearl Paul, seconded by Councillor Gordon McDonald, that a decision be deferred pending the outcome of the wider parking review. A second amendment from Councillor John Divers, backed by Councillor Graham Leadbitter, which would have seen the scheme reintroduced for a further 12 months, was also defeated. Typical short sighted view by Moray Council. "We don't know the benefits to Elgin, but it cost us £17,000 so we will scrap it". How can a serious debate have been had on this if they didn't have the figures from the retailers. To save the council the bother let me work it out on the back of a fag packet: from the report "car parks had been significantly busier". Lets assume 'significant' is 50% extra. The £17,000 lost by the council probably equates to around 12,000 cars in 7 months (assuming parking 2-3 hours each). So the 50% extra would mean an additional 6000 cars in 7 months, or 30 cars a day. 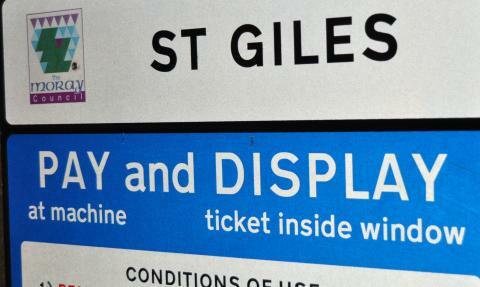 Taking advantage of the free parking my wife and I used St Giles car park around half a dozen times in the last 6 months spending on average £30 - £40 a visit (Boots, Waterstones, WH Smith, M&S, Starbucks etc). Using this spend as an average, a conservative estimate indicates that removing this scheme has probably lost around £200,000 income to Elgin city centre over the next 7 months. Well done! You'll see in the release that it was deferred, not scrapped.